This is a post about David Bowie – Do I Look Sick? Old readers, you may be wondering why I am composing a post about David Bowie, and wondering what he has to do with Invisible Illness awareness. Frankly, I’m on your side. But welcome new readers! Who have all found my site by googling for random facts and information on David Bowie. I’m all about giving the people what they want, and fate has decreed that the next group of people that need to know about invisible illness is the David Bowie fanbase. So why does this site pop up when I google David Bowie? 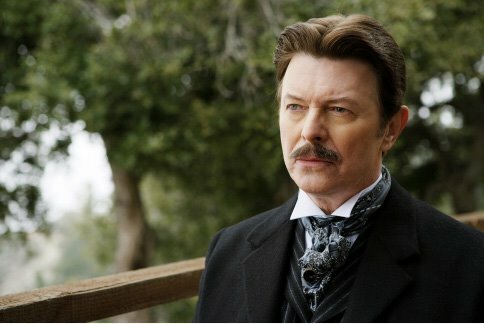 This one has a disappointing answer I’m afraid, but I’ll oblige since it took even me a while to figure out – in one of my earliest posts, I quoted David Bowie playing Tesla in my favorite movie of all time, The Prestige. I’d say I’m sorry, but I can’t because it was a good quote, and most of my readership is David Bowie fans who found this site on accident, soo…. I’m just going to try to please you guys from here on out. 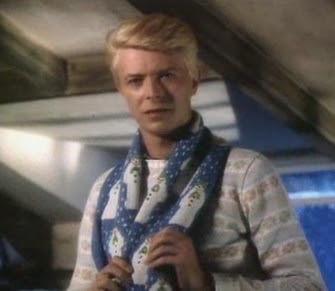 Check it out, this post even has PICTURES of David Bowie! He’s been keeping to himself, and not appearing in public much. Howard Stern is, apparently, worried about him. I had to google why that mattered, and all I can see is that they appear to be friends…or that Stern is just a big Bowie fan. I still wouldn’t trust him as an authority on Mr. Bowie’s life, though. Some songs that were never released were leaked – but even if he was sick, why would that prevent him from releasing finished songs? This seems like a non-sequitur to me. “People” have said he’s not doing well. I’m not kidding, it’s all over the internet. “I talked to a friend of a friend of David’s and they say he doesn’t look so good.” This is easily combated with all the other “people” who are “close” with him who say he’s taking more time for family, painting and drawing, and collecting 20th-century British artwork. 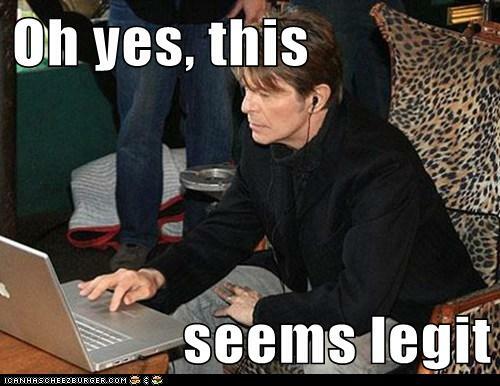 Pretty sure this is what David Bowie’s doing right now. This surgery did NOT mark a sudden disappearance – he’s performed live since then, but sparingly. David Bowie’s wife’s twitter feed is a GREAT place to get pretty accurate information if you ask me. She’s tweeted saying that David is “Happy and healthy,” and his daughter’s teacher’s have tweeted about David showing up at the school to do the Dad thing. Sounds like he’s doing alright. So I hope that puts your mind at ease, Bowie-fans. But wait! Before you go…. David Bowie isn’t very well known for his charity work, and he himself has lamented his lack of involvement with causes in general, saying “I can never make my mind up, I’m so f***ing flippy floppy.” Well, Mr. Bowie, if you’re ever reading this, I think you might be interested in my cause. Fate has brought us together – people googling about you wind up here, and I know for a fact that many of them are struggling with invisible illness and have found a nice surprise in this blog. Not what they were looking for, but what they needed. Mr. Bowie (and Mr. Bowie’s fans). 96% of people with a chronic illness have an invisible illness, meaning that they look outwardly healthy and don’t use objects like canes or wheelchairs to hint at a chronic condition. This includes cancer, mental health, AIDS (which is a cause you have fought) and many, many other ailments. About half of the world’s population has a chronic condition. You would think that something so widespread would be well-known, but it’s actually a taboo topic. This site is about raising awareness for people who are sick, but don’t look sick. The more awareness we can create, the more people can find support. People who don’t look sick are often labeled as “lazy” or “over-dramatic” when their symptoms flare up, which causes many to quit their jobs, forgo higher education, and even sever relationships. This is wrong. It should be okay to be sick, especially when it’s incurable and something you were just born with. So are you a David Bowie fan, Rachel? Anyone who knows what this is gets to be my new best friend. WHY IS THERE NO LABYRINTH ON THIS BLOG?? And a big thanks to Tumblr and the Cheezburger Network for some great pictures – except the “seems legit” pic – I totally made that one myself. Previous Invisible Illness Awareness Week Meme! Wow! So insightful! I had no idea he had an invisible illness too!!! I really think your final quote exemplifies chronic illness. At least for me. I know I personally try to meet others’ unrealistic expectations (because they don’t understand chronic illness) of/for me. I am trying to get better about this by being more honest about myself. But, sometimes the unrealistic expectations are my own :-o. And I hadn’t thought of that quote being about illness, just about me trying to please the confusing whims of my stats page, lol. But you’re right! I do get pretty exhausted living up to other’s expectations of me. I once went waterskiing with my family while I was not only having a “bad day” but I also had the flu. So I popped a vicodin and a mucinex and jumped in the lake! Def. a case of unrealistic expectations from both my family AND myself. I should do – it’s good to post something that’s been marked by a teacher; it makes it extra good quality writing with the added feedback from a professional too. I’m so glad you’re doing something like this. I have several invisible illnesses. People tell me I look so well. When my Myasthenia Gravis flares up, I can walk and talk like I’m drunk. The fibromyalgia flares leave me extremely tired, unfocused, and in bed for long periods. Last, but not least, is the Epilepsy. It’s so much fun to have a seizure in public–they get a free show. Some people have taken a step back when I told them I had epilepsy, like I was contagious. Having high blood pressure, hypothyroidism, and high cholesterol, while invisible, were not a major problem. I’m a retired RN, but I find it a full-time job to manage my medical conditions (I didn’t list them all) at this point. I’ve taken up writing since I can no longer work. I’m spending more time on websites, learning from others. Sigh. I love, love, LOVE David Bowie. He lifted my spirits so often as a depressed teen, enthralled me with his uniqueness. And will never know I exist. Thanks! 🙂 I imagine he’ll never know I exist either, though when I wrote this I had high hopes he’d find it and read it!